邓绍阳, 丁兰平, 黄冰心, 朱芮佳. 2019. DENG Shao-Yang, DING Lan-Ping, HUANG Bing-Xin, ZHU Rui-Jia. 2019. Oceanologia et Limnologia Sinica, 50(2): 420-428. DENG Shao-Yang, DING Lan-Ping, HUANG Bing-Xin, ZHU Rui-Jia. 2019. 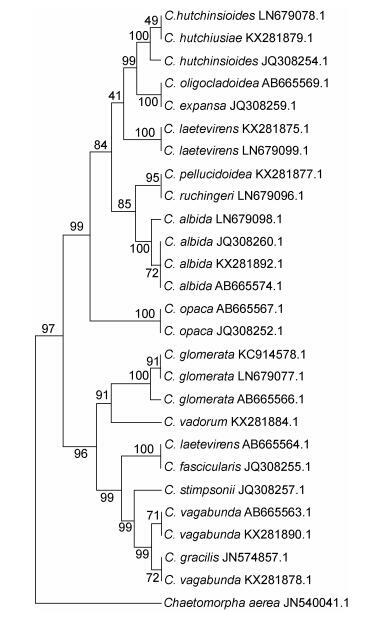 THE TAXONOMICAL POSITION ON MARINE GREEN ALGAL CLADOPHORA FASCICULARIS[J]. Oceanologia et Limnologia Sinica, 50(2): 420-428. Abstract: At present, it is disputed between Cladophora fascicularis and C. vagabunda worldwide. The morphological characteristics were observed by the collected samples of marine green alga C. fascicularis from Yinggehai sea, Hainan Island, China. 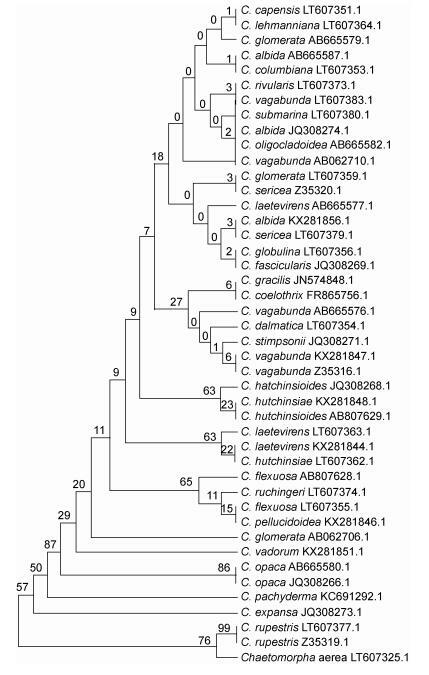 Its main characteristics were combinated under the observation and analysis to 55 samples as follows:thalli clumped, yellow green, often entangled together, 3-23cm high; the base with irregularly branched rhizoid, the rhizoids of several plants often stick together; the erect part forked or irregularly forked branching, main branch with many branches or ranked branches; the upper branches densely bunched, secund, terminal branchlets lateral and mostly curved inwards, slightly pectinate arranged with blunt point at the end; the cells of main axes, lateral branches, branchlets and terminate of branchlets with length/width 3-6.5, 3-5, 1.5-5 and 1.2-5, respectively. 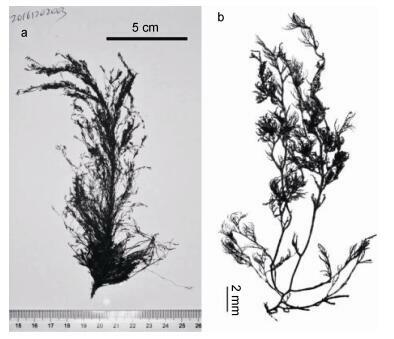 Based on the combination results between the comparison of morphological characteristics and analysis of molecular data, it proposes that that C. fascicularis is not synonym of C. vagabunda and can be as distinct species. 束生刚毛藻Cladophora fascicularis (Mertens ex C. Agardh) Kützing; Sakai 1964: 25, pl.4: 1, fig. 8; Tseng et al, 1983: 258, pl.128, fig. 4; Yoshida 1998: 62; Ding 2013: 108.